Many of the main characters in Rogue One: A Star Wars Story failed to survive the adventure, though there were some members of the Rebel Alliance that lived to continue the fight against the Galactic Empire. The latest issue of Marvel Comics' Star Wars confirms the fate of General Draven. The timeline of the current arc of the Star Wars series is after the events of Star Wars: A New Hope and before Star Wars: The Empire Strikes Back. In Rogue One, Draven attempted to prevent Jyn Erso from trying to obtain the Death Star plans, with the Rebel ultimately accomplishing her mission. Draven has learned from the error of his ways and has devoted his service to the Rebellion and the protection of Leia Organa. Recent issues of the series have depicted an intense battle between the Empire and the Rebellion, which forces Leia and other Rebels to board an Imperial ship in order to obtain codes. With Vader on their tail, the Rebels must escape the ship, as Draven refuses to flee the fight. One scene depicts Leia attempting to get Draven to board a TIE Fighter to escape, with Draven refusing. He confessed, "It always bugged me that Jyn Erso got to be the hero and I got to be the guy who was wrong." As you can imagine, Draven's encounter with Vader goes exactly as expected, though it serves as a nice callback to the events of the standalone film. 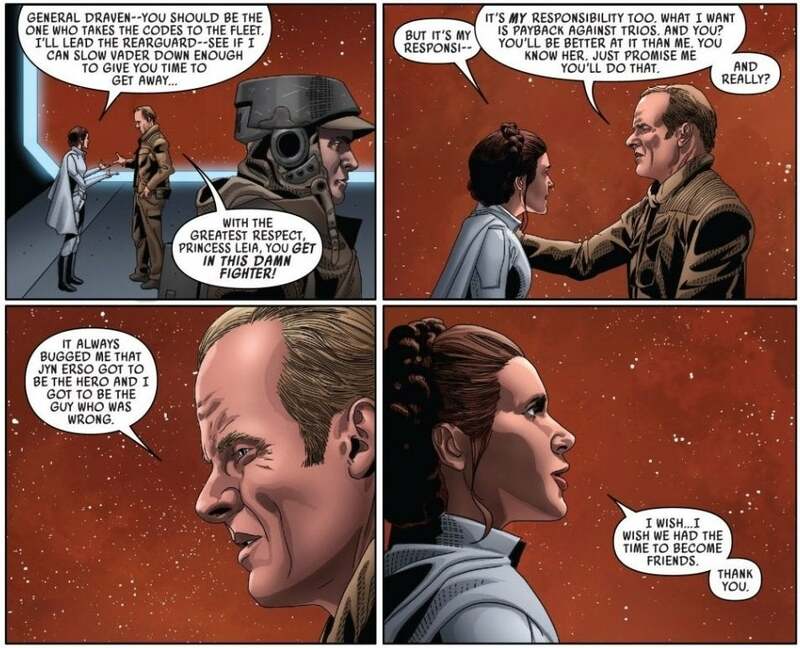 This is only the latest of many callbacks this comic series has had to Rogue One, with the storyline often depicting how big of an inspiration Jyn was to Luke. An earlier arc of the comic depicted Luke, Leia, and Han visiting Jedha to prevent the Empire from harvesting Kyber crystals. While there, Luke learns more about Jyn and the sacrifices she made that ultimately led to him destroying the Death Star. "Rogue One took whatever steps they needed. People making distractions, sacrificing themselves, amping up the signal. All improvised," Luke shared in the issue. "This chain of sacrifice...all leading to me taking that shot. I'm glad I didn't know. I have no idea what I'd have done with all that extra pressure." More recently in the current arc, Luke even took inspiration from Jyn when he had to improvise a name of a team of fighters he was leading into battle, creating the Rogue Squadron. Star Wars #54 is on sale now. What do you think about this Rogue One connection? Let us know in the comments below or hit up @TheWolfman on Twitter to talk all things Star Wars and horror!